Scientists have used a new gene-editing technique to create pigs that can keep their bodies warmer, burning more fat to produce leaner meat. Infrared pictures of 6-month-old pigs taken at zero, two, and four hours after cold exposure show that the pigs' thermoregulation was improved after insertion of the new gene. The modified pigs are on the right side of the images. Here's something that may sound like a contradiction in terms: low-fat pigs. But that's exactly what Chinese scientists have created using new genetic engineering techniques. "This is a big issue for the pig industry," says Jianguo Zhao of the Institute of Zoology at the Chinese Academy of Sciences in Beijing, who led the research. "It's pretty exciting." "They could maintain their body temperature much better, which means that they could survive better in the cold weather," Zhao said in an interview. Other researchers call the advance significant. "This is a paper that is technologically quite important," says R. Michael Roberts, a professor in the department of animal sciences at the University of Missouri, who edited the paper for the scientific journal. "It demonstrates a way that you can improve the welfare of animals at the same as also improving the product from those animals — the meat." But Roberts doubts the Food and Drug Administration would approve a genetically modified pig for sale in the United States. He's also skeptical that Americans would eat GMO pig meat. "I very much doubt that this particular pig will ever be imported into the USA — one thing — and secondly, whether it would ever be allowed to enter the food chain," he says. The FDA has approved a genetically modified salmon, but the approval took decades and has been met with intense opposition from environmental and food-safety groups. Others say they hope genetically modified livestock will eventually become more acceptable to regulators and the public. "The population of our planet is predicted to reach about 10 billion by 2050, and we need to use modern genetic approaches to help us increase the food supply to feed that growing population," says Chris Davies, an associate professor in the school of veterinary medicine at Utah State University in Logan, Utah. Zhao says he doubts the genetic modification would affect the taste of meat from the pigs. "Since the pig breed we used in this study is famous for the meat quality, we assumed that the genetic modifications will not affect the taste of the meat," he wrote in an email. The Chinese scientists created the animals using a new gene-editing technique known as CRISPR-Cas9. It enables scientists to make changes in DNA much more easily and precisely than ever before. Pigs lack a gene, called UCP1, which most other mammals have. The gene helps animals regulate their body temperatures in cold temperatures. The scientists edited a mouse version of the gene into pig cells. They then used those cells to create more than 2,553 cloned pig embryos. Next, scientists implanted the genetically modified cloned pig embryos into 13 female pigs. Three of the female surrogate mother pigs became pregnant, producing 12 male piglets, the researchers report. 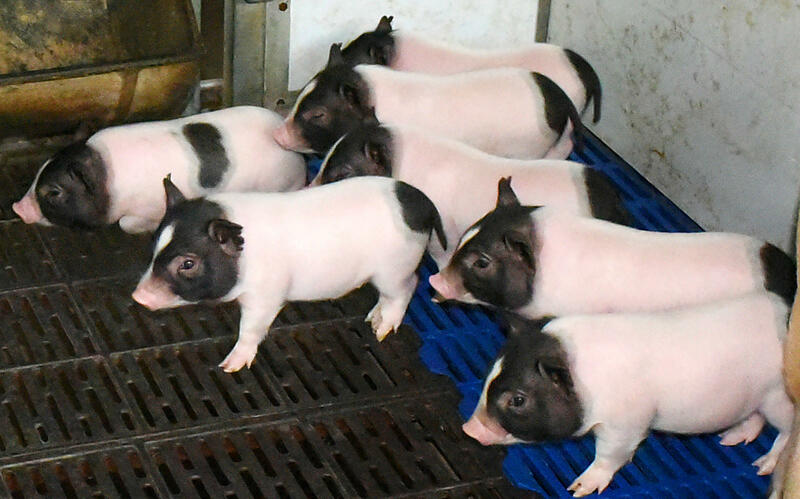 Tests on the piglets showed they were much better at regulating their body temperatures than normal pigs. They also had about 24 percent less fat on their bodies, the researchers report. "People like to eat the pork with less fat but higher lean meat," Zhao says. The animals were slaughtered when they were six months old so scientists could analyze their bodies. They seemed perfectly healthy and normal, Zhao says. At least one male even mated, producing healthy offspring, he says. Here's a phrase that may sound like a contradiction - low-fat pigs. That's exactly what Chinese scientists have created using new genetic engineering techniques. NPR health correspondent Rob Stein explains why. ROB STEIN, BYLINE: You might remember this famous cartoon character from the "Looney Tunes" cartoons. UNIDENTIFIED ACTOR: (As Porky Pig) Now, wait a minute. STEIN: Porky Pig, who got his name because he was, well, porky. UNIDENTIFIED ACTOR: (As Porky Pig) Told you I was a pig. STEIN: But Jianguo Zhao of the Chinese Academy of Sciences wanted to make a better pig. I reached Zhao via Skype. JIANGUO ZHAO: My research focused on making genetic modification in pigs. STEIN: So he decided to make pigs with a gene that pigs are missing, a gene that most mammals have. It helps keep them warm when it's cold. UNIDENTIFIED ACTOR: (As Porky Pig) Wow, it's freezing cold all of a sudden. I better get that extra blanket. STEIN: So Zhao used the latest genetic engineering techniques to make pig embryos with a mouse version of this missing gene. And it worked. A dozen piglets were born with better thermostats to regulate their body temperatures. ZHAO: They could maintain their body temperature much more better, which means that they could survive better in the cold weather. STEIN: Which could save pig farmers millions of dollars in heating costs and feed, and keep millions of piglets a lot happier and healthier in the winter. And that's not all. Because the pigs burn more fat to keep warm, Zhao says their bodies had about 24 percent less body fat than normal pigs. ZHAO: It make the pig less fat, more lean meat. STEIN: Less fat and more lean meat? STEIN: So these are pigs that are skinnier, they have less fat on them? ZHAO: Yes. Yes. That's true. STEIN: And why is that better? ZHAO: People, I think, right now like - the consumer like to eat pork with less fat but higher lean meat. STEIN: Because leaner pig meat's healthier. And so far, Zhao says the pigs seem perfectly healthy, too, normal in every other way, including probably how their meat tastes. Other scientists say the research is a significant advance. MICHAEL ROBERTS: This is technologically quite important. STEIN: Michael Roberts is a professor in the department of animal sciences at the University of Missouri. ROBERTS: It demonstrates a way that you can improve the welfare of animals at the same time as also improving the product from those animals, the meat. STEIN: But Roberts does have big questions about all this - would the Food and Drug Administration ever approve a genetically modified pig for sale in the United States? Would Americans eat it? ROBERTS: I very much doubt that this particular pig will ever be imported into the USA, one thing, and secondly, whether it would ever be allowed to enter the food chain. STEIN: Because so many people are still really opposed to genetically modified food. So who knows whether we'll ever see these low-fat pigs showing up in grocery stores in the United States any time soon? Rob Stein, NPR News. (SOUNDBITE OF BUDDY ROSS' "RUNNING AROUND") Transcript provided by NPR, Copyright NPR.